please advise us so that we can correct the problem. An educator, looking for a fun outdoor curriculum-wide educational project for your school that can involve the students as well as the teachers? An Eagle Scout or Nonprofit Organization, looking for a self-funding community project that can create added publicity in the community? An architect or landscaper looking for a unique ‘conversation-piece’ for your customers? Looking for an original and distinctive project for your yard that can also increase the value of your property? Looking for a functional, decorative and popular outdoor visitor attraction for a public area, such as a park, nature reserve, museum, exhibition or fair, which will appeal to the public and could even become a focal point for the community? If so, then a SunClock is for you. SunClocks are Interactive Human Sundials which are tailor-made for your specific location. 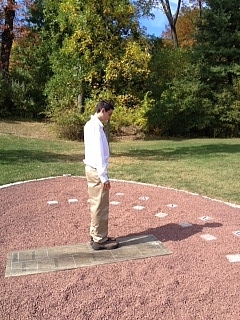 Human Sundials have many advantages over regular pedestal mounted sundials. They are most popular with schools as fun and educational DIY projects that can involve students and teachers alike. They are a very popular attraction, particularly with children, who love being an integral part in telling the time on our Human Sundials. Architects, gardeners or landscapers often include them in their projects, both private and public, as a unique, attractive, decorative and novel garden feature that can increase the value of a property and generate further orders. They can be made using a wide variety of different materials, to blend-in with their location - and (unlike traditional sundials), these cannot be easily stolen or damaged by vandalism. Sunclock is working great! Thank you for your amazing help!!! You have been amazing to work with, and I GREATLY appreciate all your help and above and beyond responsiveness. Our project is finished. It looks great and is going to be a wonderful addition to our outdoor education for the School District of Omro. Also, I took your advice of having classes involved and we were able to have two of our math people do some measurements and also our building trades class involved in the actual "stamping" and labor parts of the project. At any rate, we are installing a small marker that has instructions for use. This will be simple, as the sunclock is easy to use! We will provide easy to follow detailed instructions so that you can create your very own unique and ACCURATE Custom Interactive Human Sundial for your location, using a person’s OWN SHADOW to tell the time. Please visit the links at the top of each page to learn more, and contact us if you have any questions or to order your own custom plans.